Swimming Pools are to be looked after in a highly meticulous manner. Compromises done regarding either the 'safety issues' or 'cleanliness' of the 'pool water' can land up the manager literally in troubled 'waters'. To avoid the possible problems, a tool for timely checking is desired. A collection of metrics called 'BSC' harbors the required potential. The areas to be tracked are 'Safety Aspect', 'Internal Operations and Financial area', 'Water Content Perspective' and 'Administrative Capability'. Heading on to these, the indicators for Safety Aspect are Trainers' Grading, 'Accidental Instances in last one year, Number of complaints reported, Frequency of Water testing and Replacement. Internal Operations and Financial Perspective can be attained using metrics such as 'Cleaning Expenses', 'monthly membership collections per member' and 'Number of operational hours'. Water Contents should be screened for some chemicals that are often the culprits of 'burning yes and throat'. The parameters can be- 'Chlorine Volume' 'pH units', 'Dissolved salts' and 'Calcium Hardness'. Finally, assessment of Administrative Capability is possible with metrics like 'Memberships' rise', 'Swimmers' Accommodation', 'Water Content and chemicals' standards Compliance' and 'Infrastructure Rating'. A conventional model is used to evaluate swimming pools and other sports club. So, when talking about financial perspective, we're talking about revenue per pool member, total costs related to pool maintenance etc. Compliance with requirements from health care governing bodies must be always evaluated through specialized KPIs. Safety of pool members, especially kids, is measured through such indicators as number and recurrence of trainings, number of pool member per guard etc. Download trial version of Swimming Pool Indicators. Purchase full version of Swimming Pool Indicators + bonus. Swimming Pool management is a complicated task owing to the 'security concerns' associated with it. This asks for the swimming pool management group 'not to leave' any stone unturned in making the experience of visitors an enjoyable one. Aspects such as 'safety', 'internal operations' and 'financial needs' should be pulled together by giving them equal importance. One way in which management of swimming pool can be done beneficially is using the Balanced Scorecard (BSC) for the purpose. This has useful and relevant metrics collected on it to take forward the task of 'evaluating swimming pool issues'. By keeping an eye on the direction in which 'actual values' are moving when compared to 'target values', it is possible to correct the deviations and departures in timely manner. Ending it all, one can manage a swimming pool in the desired way by utilizing the 'quantifiable' approach of BSC devised in 1990s by Norton and Kaplan. By getting armed with one such scorecard, it is possible to embark on a precise management route, when it comes to management portion of swimming pool. Consequently, one can utilize it to the maximum benefit. Related metrics and KPIs for: Ski Resort, Tennis Club, Sport Gym, Golf Club, Yacht and Sailing Club. Customers who viewed this item also viewed: Medical Metrics. 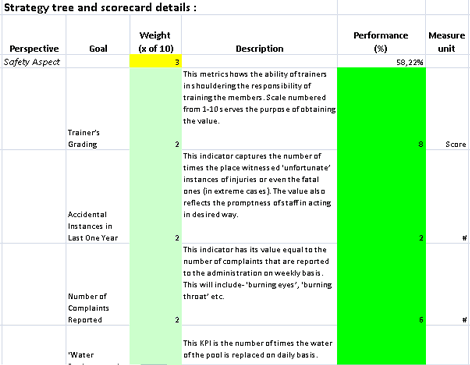 This is the actual scorecard with Swimming Pool Indicators and performance indicators. The performance indicators include: safety aspect, trainerâ€™s grading, accidental instances in last one year, number of complaints reported, â€˜water replacementâ€™ frequency, water testing frequency, water content perspective, chlorine volume, ph range, dissolved salts, calcium hardness, administrative capability perspective, swimmersâ€™ accommodation, membershipsâ€™ rise, water content and chemicalsâ€™ standards compliance, infrastructure rating, internal operations and financial assessment, cleaning expenses, monthly membership collection per member, number of operational hours, trouble shooting capability. Download a trial version of Swimming Pool Evaluation Balanced Scoreboard or purchase a full version online.